Nitric oxide plays an essential role in dilating blood vessels, which makes it an important molecule for supporting cardiovascular health. The problem is, the body's natural nitric oxide production declines over time. Adults over 40 may produce only half as much nitric oxide as they did when they were 20 years old. Nitric oxide acts as a signal for smooth muscles in the lining of blood vessels to relax, dilating the vessels. This signaling property makes nitric oxide essential for cardiovascular health. 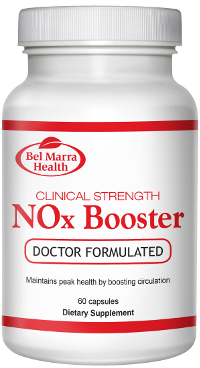 Clinical Strength NOx Booster is designed to help support nitric oxide levels as you age, supporting circulation and overall health and wellness. The formula contains 5 ingredients which either provide building blocks for nitric oxide, or help to produce the molecule. DIRECTIONS Take two capsules daily, or as directed by a health care practitioner. Do not use if inner seal is broken. WARNINGS Consult a health care practitioner if symptoms persist or worsen. WARNINGS Consult your health care practitioner prior to use if you are taking medication for cardiovascular diseases, erectile dysfunction, blood thinners or cardiac glycosides such as digitalis/digoxin, or blood pressure medication.